What You Need Before You Embark on That Self-driving Trip? If you are going to travel outside the city, there are certain things you need to put into consideration first off before you embark on the actual trip. Well, we all know the importance of prior inspection of the vehicle. It ensures you are absolutely safe and free from the worry of the vehicle breaking down in the middle of your trip. However, there is something else that is just as important and that is the list of essential items for a trip that you can't do without if you travelled out of the city. Remember the saying that goes "it is better to be safe than sorry"? It applies in every way to an out-of-town trip. There is no better way to be "safe" in such a situation than ensuring all the essentials are packed. Below are the important self-driving trip items that you need to pack for your journey. ne of the most important documents that you need to have with you in the vehicle at all times is the driver's license. Unfortunately, for some reasons most of the people just find themselves forgetting this completely document. The driver's license is proof that you are competent to drive yourself and it is always required police officers every time you are pulled over. The other must-have is the registration document. You cannot afford to forget this document if you are self-driving out of the city. I mean, there's just no way an officer will let you go without asking you to present your license and registration. Others include physical maps, contact books, a notepad and a pen, and most importantly, credit cards. The notebook, notepad and pen play an important function of helping you take notes and access important contacts like alarm response teams and emergency contacts in case your phone runs out of battery. You know those items that you use on a daily basis like water and food preservation kettles, disposable crockery and cutlery and disinfectant wet tissues? Well, you still are going to need them while on an out-of-town trip. These items come in handy when you are away from a restaurant where you can get ready-to-eat food. It is very common when you are out camping to run out of safe drinking water and food and that is why you need to have these items with you in the list. Others include timely outfits, backpacks and slippers because they are easier to use in the outside. Make sure to pack cold clothing, sunscreens, sun shakers, sunglasses, drivable soft soles, rain gear, scarves, hats and gloves. Remember you are going to be out in the cold for most of the time and these kinds of clothes will really serve the purpose. Do not forget to include a multi-purpose watch, a photo camera, flashlight, razors, tie-rope, inflatable pillows and spare keys for the vehicle. You will be surprised at how important communication can be when you are out of the city. Sometimes a phone call would be the single thing that gets you out of the hitch while on a self-driving trip. For this reason, you need to make sure that a mobile phone, an interphone, electronic map, power bank, mobile charger and GPS are among the items you travel with. Having a first aid kit packed in your vehicle is a requirement that you cannot bypass no matter the case. This is because some accidents can be inevitable and when they occur, your trip doesn't have to be interrupted. Packing a first aid kit will ensure that any emergence situation is handled in time. A standard first aid kit must include a Band-Aid, anti-heat medicine, alcohol disinfectant and bandages. These will handle a minor injury as you wait to have it taken care of by a professional. A tool box is an essential must-have if you are going to go on a self-driving trip by yourself. And, some of the tools that need to be included in the box are; a tire wretch, a bucket, fire extinguisher, emergency power, and a spare tire. An emergency power will come in handy just in case the one connected runs out or fails abruptly. Spare tires are used for replacement purposes just in case you run into a puncture. Ensure you have a DC-to-AC converter to help you with cooking and boiling water right from the bottle. When we talk of outdoor preparation, the first thing that comes to your mind is a camping tent. Well, there are others like tents, large outdoor bags, lighting lamps, sleeping bags, folding tables and chairs, gas stoves, water appliances, barbecue ovens, large umbrellas and cooking utensils among others. These items will make your experience a smooth one while on your trip outside the city. Make sure you get a camping tent that is durable and reliable enough. The Lanmodo car canopy tent will be a great way to protect both your vehicle and the rest of your items. 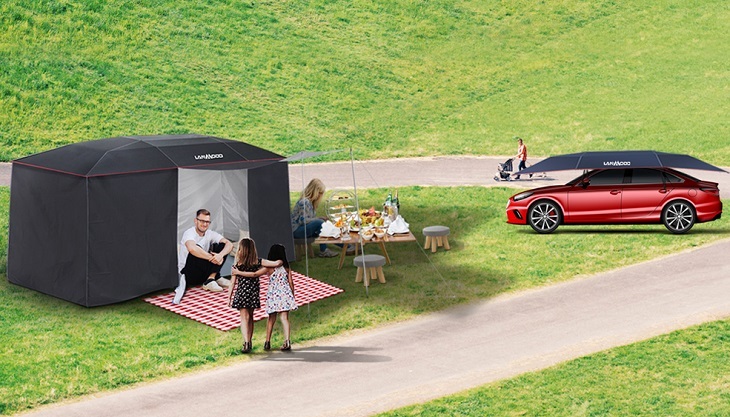 This tent is better than the rest because it eliminates the need for you to get an extra one and it is a mutil-functional car canopy tent with an easy installation. In summary, the main items that you need in your package to ensure your out-of-town trip is safe, smooth and stress-free are the essential documents, daily use items, safety and communication equipment, repair tools and outdoor preparation supplies. Once you have these items, there is nothing that can come between you and the fun of a self-driving trip out of the city.